March 31, 2016—Lipid molecules have split personalities—one part loves water, whereas the other avoids it at all costs. Lipids make up cell membranes, the frontline defense in preventing cellular access to bacterial and viral invaders. Many researchers believe that the membrane is not just a scaffold where proteins reside, but instead actually plays an important role in a number of biological processes. Researchers are also starting to see that lipids and proteins can form small patches, similar to a mosaic. This patchiness seems to have a functional role in the life of a cell and in regulating its different processes. Functional patches of lipids are commonly referred to as lipid rafts. To better understand the biological processes that govern lipid raft formation—processes with broad implications for research ranging from how cells regulate proteins to how viruses invades healthy human cells—researchers at the US Department of Energy’s (DOE’s) Oak Ridge National Laboratory (ORNL) are using two world-class research facilities to study the presence and formation of these nanoscale lipid patches. “Without having access to high-speed computing and neutron experiments, this study would be impossible,” said ORNL researcher Xiaolin Cheng. Cheng, ORNL researcher John Katsaras, and their respective research groups are collaborating to use the Cray XK7 Titan supercomputer at the Oak Ridge Leadership Computing Facility (OLCF) and the beam lines at the Spallation Neutron Source (SNS)—both DOE Office of Science User Facilities located at ORNL—to understand membrane organization and how it affects biology. In the near term, the larger team seeks to determine the presence or absence of lipid rafts. Despite efforts over 40 years, no experiment has conclusively shown the existence of lipid rafts in a living system because the rafts are very small and highly dynamic. In fact, these properties are believed to impart their unique biological functions. Understanding the size, lifetime, and connectivity of rafts is crucial to understanding their functional significance in cells. However, these parameters are poorly understood and are the focus of much of the current biomembranes research. Biomembranes are also known to be asymmetric, meaning that the inward- and outward-facing parts of the membrane are made up of different lipids. However, this added complexity increases the difficulty of experiments and simulations. Importantly, researchers are still trying to prove whether membrane patches (rafts) form across the asymmetric bilayer. Measuring undulations that take place many millions of times per second at the nanoscale, however, is not without challenges. Even with the spin echo experiment, researchers must be able to precisely assign a signal to molecular motions in the membrane and understand from where in the membrane these signals originate. This is difficult when using only experimental data, but by introducing Titan, the researchers were able to simulate how the atoms’ motions contribute to the signal. In essence, supercomputing was the only method for the team to verify its world-class experiments. Although charting the trajectories of lipids may sound straightforward, it requires serious computational power to gain meaningful insights. The Cheng group runs molecular dynamics (MD) simulations on Titan to observe the trajectories of the atoms. That means that each 2,000-lipid simulation contains millions of individual atoms the researchers must track, and each time step is 1–2 femtoseconds (one quadrillionth of a second). Typically, the team’s simulations span hundreds of nanoseconds, or, in some cases, a full order of magnitude increase to a full microsecond (one millionth of a second). Access not just to a supercomputer, but specifically to a supercomputer with a hybrid architecture, helped the team run its simulations efficiently. In fact, it took roughly 2 months of time to produce the data; the work would have taken more than 3 times longer on a traditional CPU-only machine. Cheng’s team was able to verify its experimental data successfully with simulations, laying the groundwork for bigger simulations moving forward. The team was able to simulate simplified lipid bilayers containing three different types of lipids. As supercomputing power continues to increase, Cheng and his collaborators will be able to increase the complexity of their simulations. 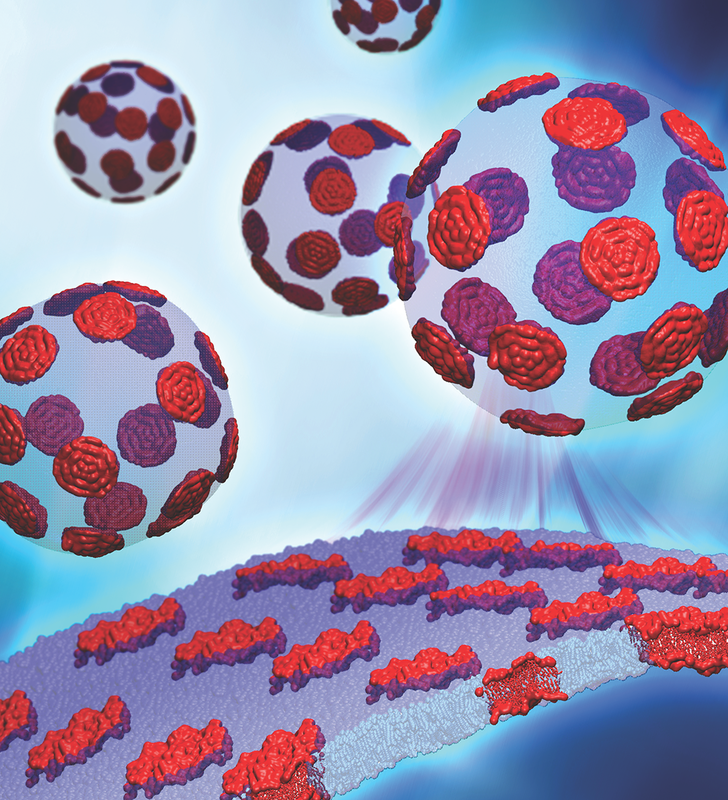 Related Publication: J. Nickels, X. Cheng, B. Mostofian, et al., “Mechanical Properties of Nanoscopic Lipid Domains.” Journal of the American Chemical Society 137, no. 50 (2015), doi:10.1021/jacs.5b08894.